IHG is piloting the Journi Mobile Task Light to improve guests’ sleep. ATLANTA—It’s no surprise that guests struggle with sleep while traveling. Even after an exhausting day in the airport or boardroom, sometimes it’s difficult to relax in an environment not your own. A global study by InterContinental Hotels Group (IHG) revealed that this marks a great concern for travelers, with four in five (80%) stating they have trouble sleeping when away from home. According to the study, business travelers lose about 58 minutes of sleep each night when staying away from home, averaging five hours and 17 minutes of sleep (adults on average should receive seven to nine hours per night). The biggest causes? A different environment (44%), unfamiliar noises (35%) and working late (35%). The solution? While there may not be one clear cut way to solve the issue, IHG is taking action and looking past bedding altogether—the company is looking to something a bit brighter. 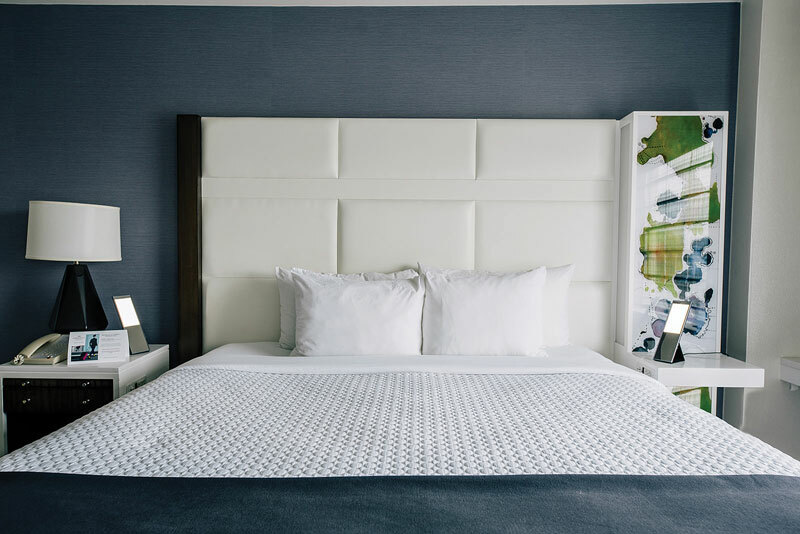 IHG has launched a lighting pilot in partnership with Healthe by Lighting Science to promote a restful night’s sleep through improving guests’ circadian rhythm. The Journi Mobile Task Light will make its way into guestrooms, not only offering a portable solution, but a user-friendly one as well. According to Brian McGuinness, SVP of global guest experience, IHG, the brand company is the first hotel company to pilot the use of this specific LED lighting technology to promote a good night’s sleep. The light is currently placed on both nightstands next to the bed, along with instructions on how to use the light throughout the room. The circadian LED light allows guests to change the spectrum of light depending on the time of day—go from warm, sleep-enhancing light to cooler, focus-enhancing light. Healthe’s patented GoodDay technology features blue-enriched white spectrum for alertness, while GoodNight technology uses a blue-depleted spectrum to encourage sleep. A technology first developed in partnership with NASA to improve the circadian rhythms of astronauts, business travelers—and even run-down tourists—are sure to appreciate the support. Circadian rhythms can influence sleep-wake cycles, hormone release, eating habits and digestion, and body temperature, among other functions. “Maintaining our bodies’ circadian rhythm is essential for health and well-being,” Lee said. According to Lee, more than 50 million American adults are sleep-deprived, resulting in $50 billion in annual lost productivity. 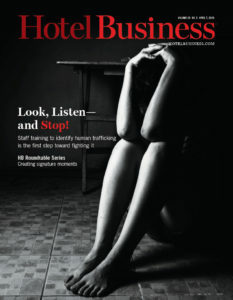 “Business travelers and tourists are particularly susceptible to sleep-related issues, due to jetlag and exhaustion. Having lighting that helps with circadian regulation will really go a long way in providing a positive environment for travelers,” he added. According to Healthe by Lighting Science, along with the National Institute of General Medical Sciences, limiting exposure to blue light in the evenings increases melatonin production by 50%, while adding 11 minutes of REM sleep per night. Crowne Plaza Atlanta Airport—located in a major hub for business travel—is the first IHG property to install the light, with two guestrooms already featuring the technology. 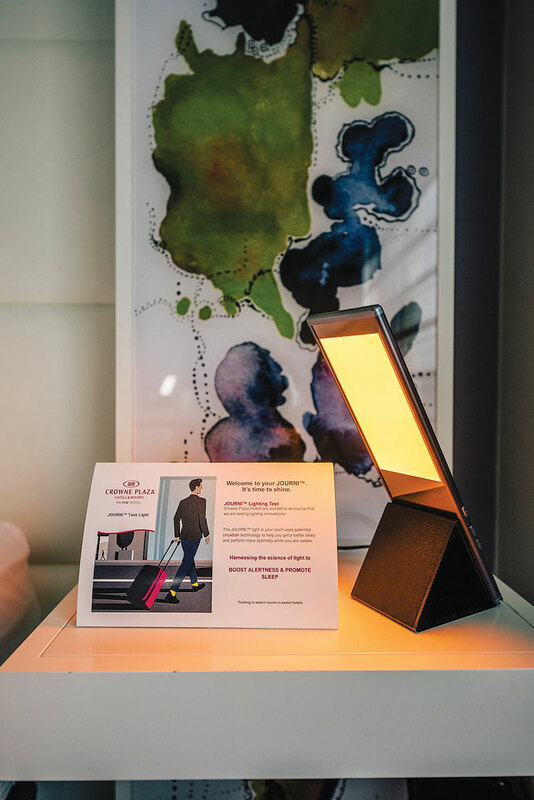 The Journi mobile circadian light is the perfect accessory for the urban traveler, Lee said, a holistic lighting solution for their entire stay, while the modern design of Journi also lends itself to contemporary hospitality design. The pilot joins a few other sleep programs launched by IHG, such as the Crowne Plaza Hotels & Resorts Sleep Advantage Program, providing guests with soft linens and This Works aromatherapy essential oils; The Holiday Inn Pillow Menu, which lets guests select pillow firmness and filling; and another lighting system at Even Hotels, which allows guests to change lighting colors in guestrooms to either promote awareness or relaxation.